Parenting ain’t easy, which is exactly why things like wine, chocolate and Twitter were invented. From refereeing board games to constantly happening upon naked children, check out this week’s funniest tweets from parents. Then pour yourself a glass of wine, will ya? You deserve it. What I say: Eat the whole thing. What my kid hears: Eat the whole thing in one bite. Gag. Spit it out. End of dinner. Go play with cars. Every threat I make after Halloween ends like this, "…OR I'M GONNA THROW ALL YOUR CANDY IN THE TRASH!" But, of course, I mean eat it. If you like having people touching you while you work, eat, sleep, and try to pee, then kids are definitely the answer. More: Where does all that extra Halloween candy go? Take the road less traveled. Like, the one with the most mud, or the wettest grass, even if there’s a sidewalk nearby. 5. Seriously, where are they? me: Where are the pictures of the dinosaurs? I am not refereeing Candy Land! I do not care who picked Princess Frostine's card! My mom sent me to the beach in the bed of my neighbor's truck. I just saw a mom get shamed for not using organic cloth diapers, 2016 is fun. 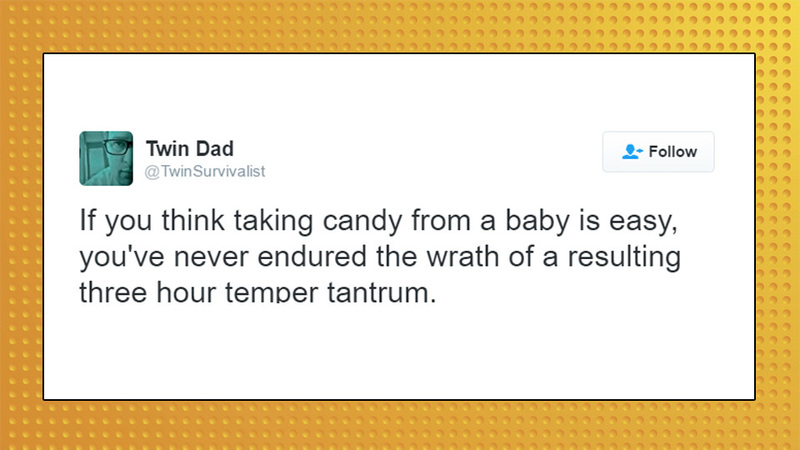 If you think taking candy from a baby is easy, you've never endured the wrath of a resulting three hour temper tantrum.